Hey, dolls! I am back today with another post and this time, we are going to be taking a look at two of E.L.F. 's Essential Lip Stains in Pink Petal, and Crimson Crush ($2.00, each). I tried my very first lip stains not too long ago (Revlon's Just Bitten Kissable Balm Stains). 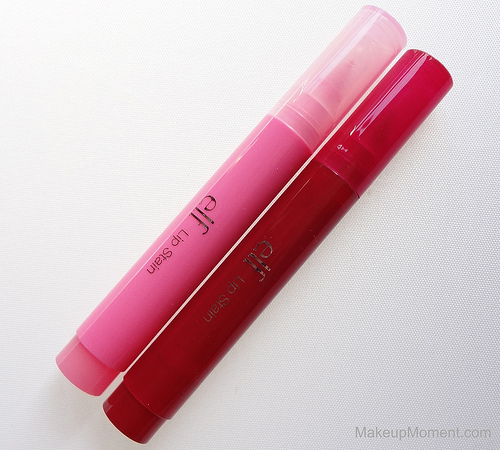 The Revlon lip stains doubled as a balm, and those contained a semi-creamy, thicker consistency. These E.L.F. ones however, have more of a thinner liquid consistency, that I hadn't really been familiar with when it came to lip stains. So naturally, I just had to see what these had to offer. Read on to find out how these E.L.F. lip stains performed, and to view swatches! Pink Petal: Soft, medium pink. 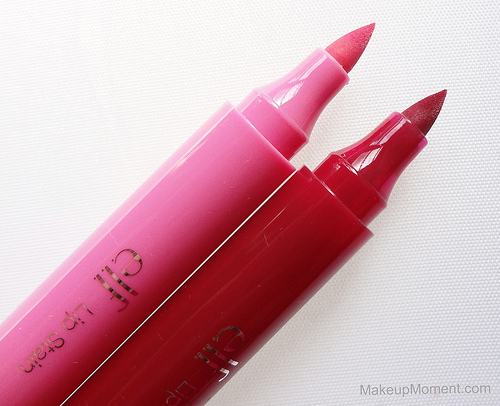 Although the color is pretty nice, this was probably my least favorite of the two lip stains. It took awhile to build up and it applied a bit patchy, and uneven. Also, the texture of pink petal was strangely drier than the texture of crimson crush. Made my lips look drier than they really are. Crimson Crush: Deep, cherry red. This one is simply stunning! Definitely my favorite one. The color is so rich, and the texture was nice to work with. Long lasting, too. It does take a few swipes/layers to reach this color intensity but trust me, it is so worth it. Especially for that gorgeous sheen finish. I see this one being a great lip color for the winter season. I am so rocking crimson crush to all of my holiday parties! I like the simple, pen-style packaging. It's practical, and the fact that there is a smaller domed shaped cap within the cap itself, is a nice touch. I feel like this ensures that the felt tip will stay moist, for a lengthier time. The felt tip applicator is very fine and it really helps with precise application. These lip stains don't contain a fragrance to them at all, which I like. But try not to lick your lips with this stuff on because the taste isn't pleasant by any means. Blech! Once the stains are on, they set almost instantly, and won't transfer. To get the most out of application though, I suggest making sure that the lips are clean, dry (no moisture on them) and smooth, before applying. 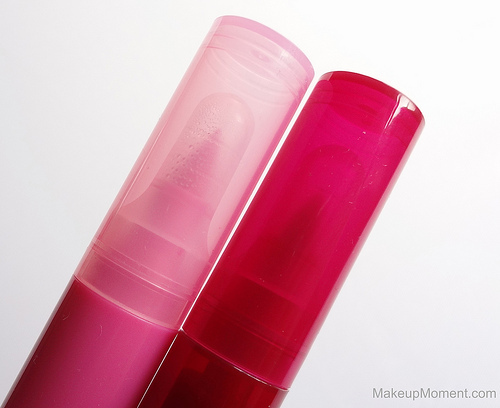 If not, these lip stains can and will, enhance any flakes and dry areas. 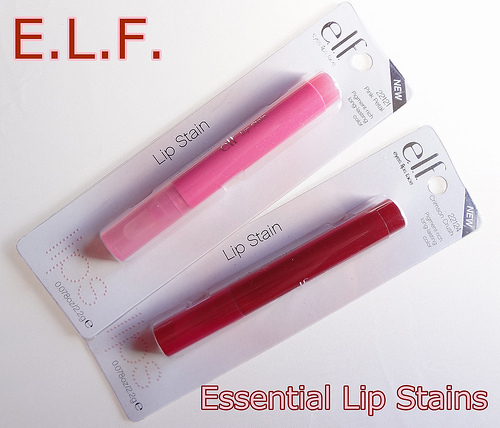 Both lip stains contain vitamin E, which is supposed to hydrate and moisturize the lips. But honestly, when I have these stains on, my lips don't feel super moisturized-especially with pink petal. In fact, I feel as if my lips are parched for some moisture. If you-like me, can't stand dry feeling lips, something I like to do is pat on a light layer of a moisturizing balm on top of these, in order to give my lips some sort of slip to them. When I do this, my lips feel much more comfortable throughout the day. As for the lasting power, crimson crush fared better than pink petal did. Pink petal's initial color faded within the 2-3 hour mark, and since the resulting stain of that one is so close to my natural lip color (I have pigmented lips), it wasn't really noticeable that I had some sort of color on the lips. Crimson crush however, held up almost all day, for the most part. It could use a touch up by mid-day to intensify the color again but, I think I like the light red stain that develops after a few hours, a bit better. It gives my lips a sweet, 'just bitten' look to them. Keep in mind that these will fade much faster if you eat and drink with the stains on. Overall: I think E.L.F. 's lip stains are worth a try. Pink petal wasn't my favorite but crimson crush just blew me away. It is such a gorgeous red color that I am sure many will love. I think I am definitely going to repurchase that one, when this one is done with. Also, I want to try the other color selections as well. These aren't the most moisturizing lip stains out there I think but, as long as I apply a bit of lip balm over these, my lips and I are happy. What do you all think of E.L.F. 's Essential Lip Stains? Which are your favorite lip stains? Both colors look great on you, I love elf so I need to try these! Thank you, Aly! 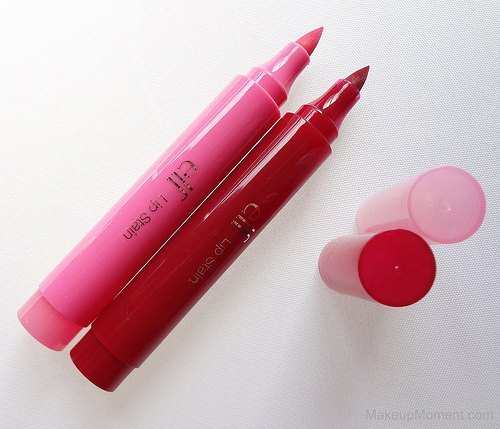 If you try these lip stains, let me know how you like them :) Which are your favorite lip stains? Wow these look great and only $2.00 each, not bad! I'm loving Crimson Crush, indeed a very rick color. I did not know that elf had lip stain both colors look pretty on you. Thank you so much, doll! I am glad you found the review helpful :) I hope you love crimson crush as much as I did!!!! Yea, I was surprised myself when I saw that E.L.F. carried these. I was pretty happy with Crimson Crush so if you are thinking of trying any of these, I would go with that one. I am curious to try the other two shades, though. I wonder how they fare? would you please give some advice on how you take these amazing pics?? Hello Mata, I just want to start off by saying thank you for loving my pictures and their quality. I absolutely love when readers let me know what they like about my blog so that way, I can keep on improving at it and making that feature the best it can be. Thank you bunches! Believe it or not I don't use a DSLR camera. I actually use a Sony Cyber-shot DSC-WX9 16.2 Mega Pixels, digital camera. I purchased it around November of last year at Best Buy and now on the best buy website the numbers seem to have changed. Instead of DSC-WX9, it is now DSC-WX50. This digital camera has been the best point and shoot that I have found, to date. The quality is pretty good and once you get the hang of it, taking lovely pictures becomes a breeze. I've been looking for a deep red lip stain for fall/winter, and recently when I was placing an e.l.f. order, I spotted Crimson Crush, and tossed it in, without even having read any reviews for it. This article reassures me that I made a good choice, and now I can hardly wait to get Crimson Crush! I LOOOOOVE deep red lipsticks on me, and I think Crimson Crush will make an ideal base for those shades.